Intelligent virtual assistants enable consumers to efficiently accomplish their online goals facilitating decision support during benefits selection and enrollment, filling out forms or applications, or managing health assessments and online tools. Health insurance organizations, employers, and eHealth technology providers are integrating IVAs as a core piece of technology to enhance the healthcare consumer experience, increase efficiencies, boost voluntary benefits enrollment, energize mobile engagement, and improve wellness participation rates. This guide reviews market drivers which are spurring innovation in benefits self-service and enrollment as well as disease management and wellness engagement. 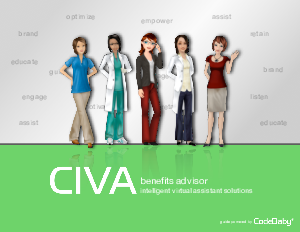 In addition, it overviews the main capabilities of the leading virtual assistant solution, CIVA benefits advisor.